When Motorola debuted the original DTR Series, the concept of a low license free digital radio for business use was somewhat of a novel idea. It didn't take long, however, for the DTR410, DTR550 and DTR650 to become niche favorites with certain businesses and even some consumers. Recently, the company introduced two new models to their DTR line. 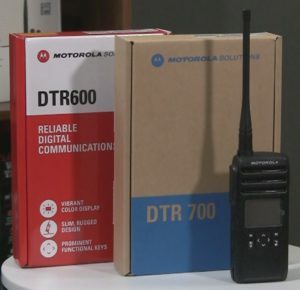 The Motorola DTR600 and DTR700 enhances an already popular digital series. Motorola's DTR products are different from most of the other business radios that we carry at Buy Two Way Radios. Instead of operating on a single selectable frequency, DTR series radios constantly hop from one frequency to another in the 900 MHz wavelength. This provides several advantages over typical radios. 900 MHz frequencies offer greater range than traditional UHF radios and the ones used by the DTR series don't require a license. The frequency hopping technology makes it very difficult to eavesdrop on a transmission using common receiver technology, such as scanners. The DTR series also has clear, digital sound and advanced features, such as one to one calling. Now, with these two new models, Motorola brings the DTR series into the next generation of license-free digital communication. The DTR600 is the newest edition to the DTR series and replaces both the DTR410 and the DTR550. 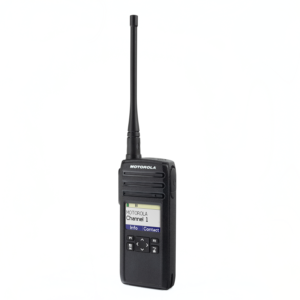 It is compatible with all other DTR series radios as well as Motorola's DLR series radios. The DTR600 is physically a big improvement over the previous series. It's thinner by around a third of an inch, but more noticeable is the larger, full color screen. The DTR600 will work right out of the box with support for up to 30 license free channels. Many customers choose to use the radio without any additional configuration, and this is fine - an out of the box DTR600 will work like a typical radio and you will still get the great digital sound and great range. If you're willing to do a little configuration, however, you can really unlock the power of the DTR series. By building a contact list of each radio in your fleet and defining private radio groups, you can make it simple for your employees or coworkers to get in touch with exactly who they need. A programmable side button can be set to allow for private replies, a direct call to a frequent contact, all call, or even to page all units. Instead of the traditional belt clip, the DTR600 and DTR700 include a holster. This allows you to securely attach and remove the radio quickly and easily. The holster includes a nice feature. The belt clip portion of the holster has an area that is specifically designed for you to wind any extra cord from your earpiece, so it's not dangling and in your way! By purchasing an optional programming cable (HKKN4027A), the DTR600 and DTR700 can be customized using PC software freely available for download from Motorola. Other optional accessories include a 6 radio multi-charger and a wide variety of earpieces and other accessories. 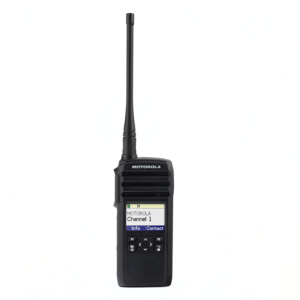 Both models are in available to ship from our warehouse at Buy Two Way Radios. This entry was posted in General, Articles, Business Radios, Motorola and tagged Motorola, DTR410, DTR550, DTR600, DTR700, DTR650 on February 8, 2019 by Rick. We discuss the use of two way radios in the operation of haunted attractions, or haunts. We also review the Motorola CLS1110 and CLS1410 business radios. we talk about the use of two way radios in haunts. We'll discuss why radio communications are important for use in haunts, the types of radios used, and some recommended radio kits for use in these attractions. Radios discussed include the Motorola CLS and Kenwood TK-3230 business radios, Motorola DTR410 and DTR550 900 MHz digital business radios, TriSquare 900 MHz radios, Midland GXT1000VP4 and Motorola Talkabout MH230TPR consumer radios, and the Ritron Jobcom JBS-446D Base Station/Wireless Intercom. For more information, read our blog post Two Way Radios For Haunts. Today we review the Motorola CLS1110 and CLS1410 business radios. This entry was posted in Two Way Radio Show Podcast and tagged UHF, VHF, MURS, FRS, GMRS, Midland, Kenwood, Motorola, digital, DTR410, DTR550, TriSquare, TSX100, TSX300-2VP, 900MHz, CLS1110, CLS1410, TK-3230, GXT1000VP4, MH230TPR, Ritron, Jobcom, JBS-446D, IntercomFHSS, haunted houses, haunts, attractions on September 26, 2011 by Rick. In this episode we present an introduction to 900 MHz two way radios. We also review the TriSquare TSX300-2VP 900 MHz radio. We talk about 900MHz two way radios. We'll discuss how they operate, some of the features unique to these radios and the advantages of using these types of radios compared to FRS, GMRS, and some analog business radios. 900 MHz radios discussed include the Motorola DTR410 and DTR550 900 MHz digital business radios as well as radios from TriSquare. Today we review the TriSquare TSX300-2VP Two Way Radio Value Pack. This entry was posted in Two Way Radio Show Podcast and tagged UHF, VHF, MURS, FRS, GMRS, Motorola, digital, 900 MHz, eXRS, DTR410, DTR550, TriSquare, TSX100, TSX300-2VP, FHSS, ISM, Frequency Hopping Spread Spectrum on September 5, 2011 by Rick.